From 31st of May until 3nd of June 2019, these elements will come together to form an open-air electronic music festival on the Albanian Coastline. 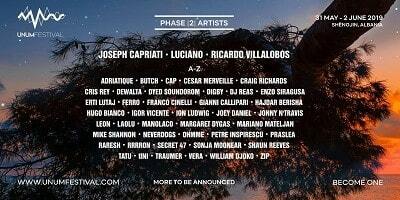 We present to you, UNUM FESTIVAL. UNUM in Latin means “One”. Not one as a number or measurement, not one as a singular, but One as a whole. It’s the type of place where the name of the festival really makes sense, with music and scenery coming together to form a blissful dream; sunlight glistening on the sea as you feel the sand beneath your feet, and the smooth sound of the wind softly gliding through the pine trees. All set against a mountain backdrop, the perfect space for hearing so many respected artists from around the world. Marduk / Valkyrja во Скопје! 23.04.2019 МКЦ!